Dylan's Blog: The hills are alive……..
Oh yes indeedy wait till you hear what I am up to now..
A red head, an Irishman, a singing nun, and some of our favourite things…!!!! Yup you heard me correct me and the lovely Jim West will be your hosts/guides/partners in crime as we travel round these beautiful countries. Me and Jim will just have to have some matching outfits as we channel the Von Trapp family. I absolutely adore the film, the Sound of Music and so there will be no stopping me with the singing and the excitement. One of my favourite bits will be visiting the fountain from the film and singing Do Re Me…he he so easily pleased. Amidst all the laughter and the frolics I will be fitting in some art journaling techniques for you to learn, and you will have a fabulous goody bag of specially designed products to boot. Can you really afford to miss out on all this frivolity??? No I thought not… I am not taking a massive group as I wanted to get to know you all so spaces are limited. So when is this adventure happening you ask yourselves….May 23rd to the 31st 2015. They do payment plans so you have plenty of time to save your pennies. I'm not sure I can actually go that long without bursting with excitement but we'll see. Wagner. 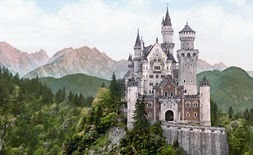 If I remember rightly it was also used as the inspiration for the Disney princess castle. 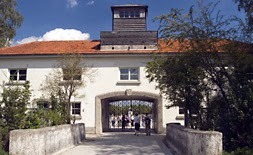 There is also the option to finish the trip with a visit to Dachau, a must for me personally. I really can't wait for this to come around and hope you are excited to join me. I can't wait to go! !